Daisy Victor 87 year old woman wins the bronze medal at World Athletics Championships Master 2018 . Bronze medal - Master 2018 World Championship. 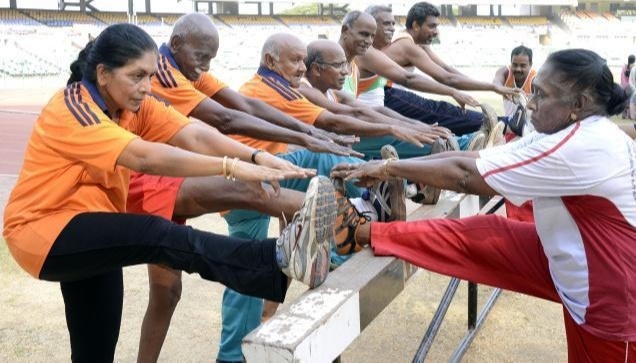 Sport does not have an age. Athletics is a very demanding sports discipline for that reason it was considered that young athletes were the great protagonists of athletic competitions. 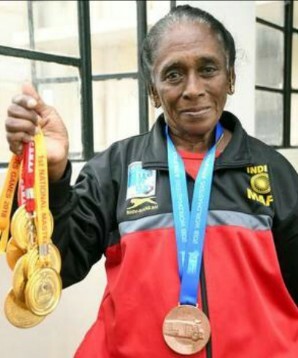 That belief was defeated by the athlete Daisy Victor who at 87 years of age won the bronze medal in the Master 2018 World Championship. She is originally from Nazareth, a town near Tirunelveli in Tamil Nadu. This city was the scene of important historical events since the nineteenth century and the many historical monuments that decorate the city and its neighboring Palayamkottai are witnesses to the fortress and the people of Tirunelveli. How can anyone not know of the mouth-watering famous Tirunelveli Iruttu Kadai Halwa? Daisy possesses the brave blood of her ancestors. Daisy has been the queen of the track and field for nearly 8 decades, started running at age 8 and still doesn't stop. She feels a passion for the sport of the track and field from a very early age. 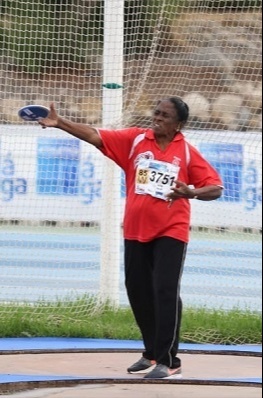 This woman wonders practical races, long jumps, discus and bullet throwing for over 79 years. That's a tough record to beat in both female and male categories. The impetus to live a full life drives Daisy so that every day she starts her way to the track where she trains. She exercises for hours with the enthusiasm of one who prepares to compete and is happy while practicing the sport that she loves. This incredible woman trained even during her pregnancies and until the third trimester of gestation. Her children were born healthy and strong and she resumed her training one month after the birth of each one of them. The continuous training prepared her body so that the pregnancies would take place in perfect harmony. When her children were born, the muscular memory accumulated after years of training allowed her to return to the tracks. In a short time, she recovered the physical conditions required to reach optimum levels. The most extraordinary thing about Daisy Victor's athletic career is that she broke myths and established herself as an athlete in the mid-twentieth century. In the 1950s, the athletic potential of women who were already mothers was still unknown. Daisy is an avant-garde athlete who moved ahead of her time and continues to dispel myths. Daisy Victor has competed in domestic and foreign events accumulating triumphs and extraordinary experiences in her 79 years of sporting career. She has won 345 gold medals and more than 400 medals in total is an example of her generation and of future generations. The accomplishments of this incredible woman are the result of family love and her unshakable heart. Her parents' efforts to stimulate her sporting career when she was very young sowed the sporting seed that would accompany her during her successful life: "My dad initiated me into sports. I started running when I was eight and till today, continue to run" said she. Later she enjoyed the support of her husband Victor Sundaraj and her children. She worked, trained and cared for the family every day. To be an athlete requires exceptional talent and skills. But to be a competitive athlete is indispensable to have the support of the family and an excellent coach even more if it is a woman who extends her career for almost 8 decades. For Daisy, one of the greatest satisfactions of her career was the recognition she received in 1981 by the former Prime Minister of India, Indira Gandhi. This recognition was an honor that honored this magnificent athlete and served as a stimulus for the women of India. Daisy continues to prepare to participate in national and international events. She does not receive financial support from the government, the costs of training and travel come from her work. However, she believes that obstacles are tools that athletes should use to strengthen themselves. Daisy has participated in recent years in international events such as the World Master Athletic Outdoor Championship in Malaga on 4 Sep 2018 in the categories W85 Shot put 2 Kg and W 85 Discus (.75 Kg). She is ranked 87th in the World Ranking. She recognizes that her accomplishments induce the growth of athlete support programs and that encourages her to move forward. She expressed special appreciation for Dr. Kannan Pugazhendi of SPARRC. This institute has sponsored and continues to sponsor athlete-oriented treatments at no cost. "For actions like this it is worth continuing in the sport," she said. In her long career, Mrs. Victor learned to fend for herself and developed a powerful personality that kept her several generations ahead of her contemporaries. Daisy was never content to do what a traditional woman was expected to do. Her goals were always to demand more of herself, to strive harder, to go further, and she has done it.